The Trail Station Café is open daily from 8:30am – 5pm, Monday to Friday & 8:00am – 5:00pm on weekends. The cafe boasts a variety of ice-creams, homemade snacks and light lunches, hot and cold drinks and most importantly, delicious NT Roasted Coffee! The now famous “secret recipe” vanilla slice is well worth trying also! You can also become a member of our “Frequent Sipper” club for loyalty caffeine bonuses! 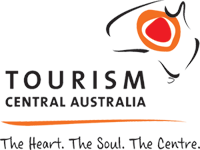 The shop is well stocked with great value and unique range of souvenirs and gifts including books, toys, postcards, clothing, and a range of Alice Springs Telegraph Station – and also Outback Cycling merchandise. The Alice Springs Telegraph Station is also still a functioning post office – you can buy your postcards and stationary, as well as your stamps in the shop. All mail posted in the original Red Post Box at the Alice Springs Telegraph Station is also stamped with our unique franking stamp – just as it always has been!